Two swimmers at Ventura beach in California were caught in a dangerous riptide. 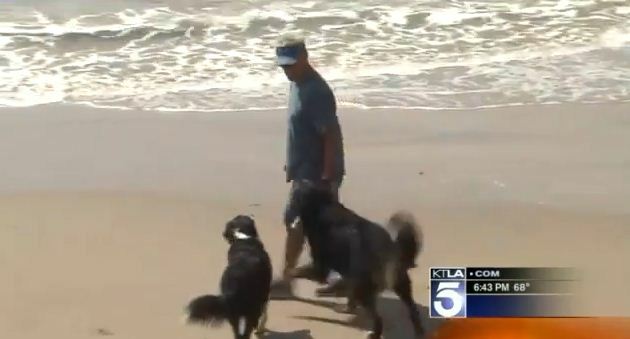 The one who came to their rescue was not a lifeguard, but a helpful Bernese Mountain Dog. Meet Nico, a 3-year-old Bernese Mountain Dog who just save the lives of a couple who were trapped by the strong current at Ventura Beach. Nico’s owner, Dan Clarke, who is a former lifeguard, had just recently adopted Nico. He said that during the incident, Nico paddled to the struggling woman, who then grabbed onto Nico’s chest, holding her boogie board in her other hand. Nico guided her to the shore. The woman’s husband tried to rescue her but he was also caught and taken by the current. Watch the video below for the full story! Nico is a hero! Imagine, he bravely rescued the couple, and he wasn’t even trained for anything like that! Isn’t that amazing? Share this incredible rescue story!